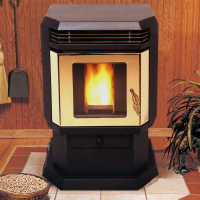 EasyFire pellet heaters combine state of the art technology with a renewable, environment friendly fuel source. Pellets formed of recycled wood are fed into the heater and burned, offering the warmth and ambiance of a wood burning stove. The digital control system constantly monitors the EasyFire's performance providing even heat with minimum fuel and electric power consumption. These are only a few of the features that are combined exclusively by the EasyFire Pellet Heater. Current models bring a new level of performance and reliability with the release of our B1 models. Through a process of continuous product evaluation and improvement, EasyFire's are "the state of the art". EasyFire has engineered the total solution by combining DC Drive Technology with Autolite Ease. With the optional AutoLite system, your stove will start and stop based on wall or remote thermostat settings. The AutoLite system utilizing standard AC power and an industrial style element will start the pellets burning in the burn pot then switch operation to the digital control system. This allows for battery back up operation of the stove if the house AC power fails. If the power fails and the stove is not in operation, it is a simple matter of hand lighting the stove and running for days on DC battery power (12V DC battery must be connected). Additional design features include a feed disk system designed to prevent clogging, pellet surges, and an easy to maintain heat exchange system which reduces cleaning time. 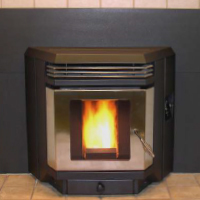 The EF4001 insert is designed for installation in today's small factory built fireplaces. Lowest electric power cost in industry (less than 60 watts). Digital control system minimizes fuel consumption. Simple, trouble-free single switch Low, Medium, High settings. Easy cleaning and simplified maintenance. Easy installation, including mobile homes. Meets EPA 2020 emission standards. Base units include 12v Battery Backup System, add options to build complete unit. Battery and Battery cable purchased separately (except EF5001U/S). 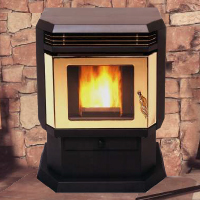 to cover fireplace opening 40" wide height adjusts from 25-32"
Limited lifetime warranty: Lifetime warranty on the logs, 5 years for the firebox, 1 year on components, 2 months on flame strips (light bulb excluded).